Discussion in 'Auto News' started by lancia delta hf, Mar 25, 2019. Not really a complaint, but that roof line has a bit of Ford GT in it. 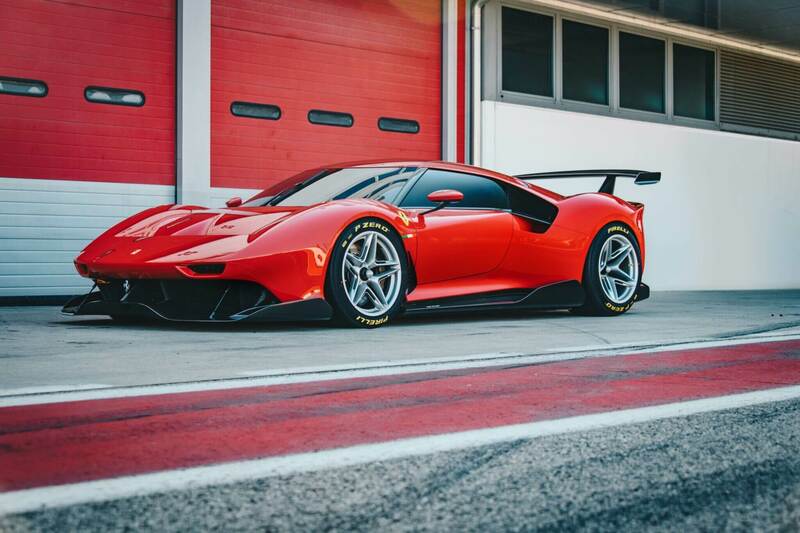 Looks like a good example of, what if the 488 GT3 wasn't restricted by rules though. Dan, TheNuvolari, Andyc709292 and 1 other person like this. GranTurismo guy, Dan and TenEightyOne like this. This article was published by Kyle Patrick (@SlipZtrEm) on March 25th, 2019 in the Automotive News category. In all seriousness, I like this far more than the 488/F8. It doesn't necessarily scream Ferrari, but there's a lot of interesting design details, like the divider in the side intake forming as a strip below the window. Carbon_6, RandomCarGuy17, TheNuvolari and 3 others like this. Made for a single "connoisseur" in Hong Kong...while 1 million people in Hong Kong live in poverty and have to avoid eating to pay rent. Surely this man's wealth is beyond necessary when he fights boredom by asking Ferrari to make him a one off car. JCH8r, Belifant and Sander 001 like this. Looks very retro to me inspired from the 80's Ferraris... It just needs pop out headlights. lancia delta hf likes this. You're drawing some interesting connections there. I don't know these people, how did he cause poverty? I'm curious how you know. On the Ferrari... that is so amazing looking. Right up there with the best of Ferrari. Dan, Heldenzeit, TenEightyOne and 6 others like this. It looks like someone took an axe to the Ford GT and stole the headlights. Those are some of the most baffling comments you read with these kinds of stories. "Someone just bought a $3 million car! Think of all the helpless people out there that could use that money!" Meanwhile, said owner probably donates more money than these people ever will. Carbon_6, Dan, Heldenzeit and 10 others like this. I feel that way about governments and massive corporations (IE, “they’re spending millions on a border wall or autonomous vehicles, think of all the better uses of that money there is”), but when it comes to an individual person, they can spend their money however they see fit. This is certainly the best looking Ferrari in at least 30 years, and other than the 458 and FF/GTC4lusso the first Ferrari that personally appeals to me since the F355 and 456. It's complicated, and more harmful than most people realize. Is the cost of that one car going to make a difference? No, $3 million isn't going to do squat for anyone. But the billions and billions sequestered in the bank accounts of billionaires could/should be in general circulation. The concentration of wealth that allows all this cool stuff to happen, for "an individual" to spend like this, comes at a cost to you, me, and everyone who isn't sitting on billions of dollars. I'm old enough to remember guys going to work at GM for a summer and being able to pay for a semester of university AND buy a cool new car on that summer's salary. How often does that happen now? Do remember part time jobs paying for muscle cars? I owned an 86 Mustang 5.0 GT in high school. I paid for it through part time, minimum wage jobs. Anyone doing that now? How many new, and nearly new muscle cars park in local high school parking lots now? ...dudes like this are part of the reason that isn't happening anymore. That's why it bugs me. Wow. I did not know that this guy is raising the cost of Mustangs. Can you explain how? So you’re saying what exactly, wealthy people should give up their weath because it’s shameful to be successful? For an economy to work you have to have rich and poor, without the two the monetary system just doesn’t work. At all. Did you ever consider that on a technical level a modern Mustang is a considerably better car than a classic one. I’d also argue that the increased costs revolving around oil as well as taxes are more to blame than a rich guy in China. And here’s the real head scratcher, if the weath of the super wealthy was spread around, how much better off do you think you would actually be? And, if it did make everyone significantly richer, do you not think that in itself would inflate prices considerably more than they currently are? A good 12 minute video. Spme nice close ups of the dtailes. Whats with Ferrari wasting all of its beautiful designs on one off cars. You can thank the owners in part; to my understanding, many of these 1-off owners get a lot of say in how they would like the cars to look and what model will be used as the basis. They're spending millions of dollars & Ferrari is letting them in on the development as part of that. All I can say these rich dudes when it comes to one off Ferraris sure do have taste. Who designs an one-off car like this Ferrari? Is it the guy or is it Ferrari or is it Ferrari listening to what the guy wants? PS: it has only one tail pipe. I like it, but it looks more like De Tomaso Pantera. LeGeNd-1, Kingofweasles, WJHMH and 1 other person like this. Most of the time, I reason exactly as you do but the other posters have a valid point as well. Many of the very rich and wealthy people donate a lot of money to charity or support medical research. If this person wants this car, why wouldn't he (and I think it is a he) not buy it? What bothers me more is the waste of good food every year while a big portion of the world can't even afford a simple meal. This comes to mind. Let him or her enjoy this car. This person probably worked very hard for his/her cash. Not everybody is dealt the same deck in life. If I had that kind of money, I would definitely donate money and help individuals who need help. But I'd definitely also buy stuff for myself to enjoy, like a huge Porsche collection. Maybe, I'd buy one Ferrari even though I'm not a fan of Ferrari. curtis 1-8-7, RCKakashi14, Voodoovaj and 1 other person like this. I'm in support of the OP. I'm not in support of his rant about this specific mysterious Hong Kong man, but the principle behind his rant. People just are not seeing the big picture anymore. The rich are getting richer, whilst the general public are getting poorer. Yet when you say it out loud, the general public want to shut you down!!! Puzzling to me why the public are happy to accept less for themselves. How are the rich getting richer and the poor getting poorer? Let me give an example that I know will ring bells. Is it right for the CEO of a Bank to give themselves and the board a pay rise when they are already on some ridiculous 20million + package. The reason they can back the pay rise is because they made a record profit for the bank. They manage to do that every year. All the major share holders are happy because they just look at their end result of higher dividends and share prices, so do not really care that the directors are getting a pay rise. How did the CEO and the board do this, hmm, cutting local jobs in 1st world nations, off shoring call centres, automation, less customer service, very small or no pay rises to the regular workers they have left etc. And that goes for all industries, not just banking. I picked banking as that is an example more people are likely to agree with as more people seem to dislike banks compared to other industries. Said banker now can go to Ferrari and get his custom car built at the expense of regular Joes. I've seen some people post that if a person works hard they deserver the 7 figure + salaries they are getting. Sorry but they are not working that hard in my eyes. Others will claim they take a bigger risk. Sure, powerline workers take a bigger risk if you ask me. I'm sticking with "A fair day's wage for a fair day's work" moto. I guess that makes me some sort of Labor supporting union freak in this modern Liberal desensitised world. BTW to be on topic, the car is not Ferrari pretty. Fun to see glimmers of Ferrari's iconic design language in this modern form. It's a really cool looking car, as was the SP38. Just makes you wonder why they can't manage to produce the same results with a single one of their production models. Perhaps they should take a step back and look at what they've made here. Perhaps time to review the current production model design formula: Add more F1 buttons, add more aero, more LED's, more metallic paint, bend all the lines into even more confusing forms. I’d love to discuss this further @zdenko, but I feel that I would drag the thread waaaaay off topic, however I respect your opinion even if I don't agree fully . I definitely see some Pantera cues in there too, good shout . Sorry for taking this off topic. Seriously, I was venting. That said, a quick search of Hong Kong billionaires with the initials "TK" revealed Thomas Kwok. This is the likely candidate for the person being the same TK behind this car. Likely, because there aren't any other Hong Kong billionaires with those initials. He inherited his billions from his father and was released from prison on March 21st after serving 5 years for bribery. It appears this car is a gift to himself for getting out of jail. Yep. He worked really hard for his money. But, on the car, I'd be more excited about it if it were a limited production item, like the FXX, FXXK, etc. As a custom one off for a billionaire, especially in light of the events, it seems tainted to me. The F40, F50, Enzo, etc., were all celebrations of speed and all the Ferrari embodies. This thing is a celebration of all that is wrong with the world. And it looks like a 1979 Corvette. You're completely forgetting that this is China we are talking about, where income inequality is dangerously high and corruption is rife. You could also apply this to the Middle East. Economics. Not every job, or effort is worth the same amount. And it does pay to be the kid of someone who wants to give their kid their money. Wrong again bucko... this thing is gorgeous. This thing is a celebration of all that is wrong with the world. I'm still trying to figure out how this guy is raising the price of mustangs. So, he has, what did you assume... billions and billions... and he, what did you assume... keeps it in the bank (despite spending lavishly on a Ferrari). I'd like to know how him not buying a Ferrari would reduce the cost of mustangs. Or perhaps how if he had bought a mustang it would reduce the cost of mustangs? Or how giving millions to Ferrari raises the cost of mustangs. Or how him not spending "billions and billions" either raises the cost of mustangs, or makes your money worth less. This is fascinating information, and I really want to understand the economics of it. So Ford produces a mustang and... this guy doesn't buy it... and then they raise prices? Is that how it works? The price of a Mustang hasn't actually risen relative to the other things that have also risen. However, salaries have not risen at all. It's not this one guy, it's the billionaire class in general. See, when it comes to employment, you are the product. The employer is buying your time, and it's a supply and demand market. The reason a pro QB gets a ton of cash is because there is a huge demand for his services and the supply of people like him is small. For regular people, there's a ton of people able to do most jobs, and there's fewer and fewer jobs to go around, ergo the cost of labor drops. However, in a healthy capitalist economy, the product of labor needs to be shared with the employees in order to keep the wheels moving. Billionaires have become billionaires because the money that was supposed to be paid to people who got them there has, instead, been sequestered (banks, capital investments, etc.). When you get into the billions of wealth, the lack of movement in that money is extremely detrimental to the world as a whole. $1billion is the equivalent of being paid $10million a year for 100 years. Or, it's the equivalent of 1000 people earning $million a year, etc. As an example, my first real full time job paid me $27000/year. That's a step up from the job I had as a car detailer, which paid $20,000 a year. A nice house was about $120,000. So, lets say I had a little extra and we round up to $30,000 (for easier math). House to Income is 4:1. The same kind of house now, in that same city, is about $$480,000, so that same "first job" should be paying $120,000 a year. If we use my crummy car cleaner job as a reference, houses were 6:1, so that crummy job as a car detailer should now pay $80,000 a year. ($480,000/6). However, that car detailer job is now a minimum wage job and pays, wait for it, just over $20,000 a year (30 years later). What's worse, those house prices are also not reflective of a free market, but they are high because of, again, of the ultra wealthy. Toronto, like Vancouver, is a haven for sequestering money. Foreign buyers were bidding up to a $1million over asking for properties. That drove up prices in Toronto, driving people out of the city and driving up prices in the suburbs, the people from those cities, had to buy houses in further outlying suburbs, etc, etc. This is happening is many places around the world. This dude is in real estate in Hong Kong. Properties there cost more than (US)$1500 per square foot. So, something the size of a jail cell is about $75000. It hasn't become this way because of a normal free market. So, back to the mustang, it's not the Mustang that got more expensive. It's the labor that keeps getting cheaper, and where there used to be labor laws (and taxes) that kept those billions circulating in world economies, that actually protected the basis of healthy capitalism, the lax policies labor and taxation allow billions to be sequestered. On top of that, since the wealthy get wealthier, the price that the market will bear on luxury items, such as a Shelby GT350, go up. The gap just keeps spreading. I'm all for people succeeding through effort (heck, I am one of them). I am all for millionaires. I'm actually in favour of people having hundreds of millions in personal wealth. Those levels are good and healthy and will keep us all happy. However, multi-billionaires are a problem. Greed is good, but it's no different than anything else that can be too much of a good thing. This topic is a Pandora's box once you start getting into it. And it still looks like and old Corvette.